Does Dementia Increase the Risk of Dental Decay? Recommended citation: Emanuel RJ. Does Dementia Increase the Risk of Dental Decay? OBM Geriatrics 2019;3(1):10; doi:10.21926/obm.geriatr.1901040. The amount of patients who suffer with dementia is set to rise with an ageing population. As well as living longer, patients will be retaining their natural teeth into their later life and will be less reliant on dentures. From both the current evidence available in the literature, and anecdotally from clinicians experienced in treating patients with dementia, it can be concluded that on balance, patients with dementia appear to be at a greater risk from dental caries (dental decay). However, more research in this area would help produce a firmer evidence base to support this conclusion and should be encouraged. To improve clinical outcomes for patients with dementia, it is important for clinicians to ensure that patients have access to high quality preventive care which should include dietary advice and fluoride supplementation where appropriate to help mitigate this increased risk. 1. Does Dementia Increase Dental Caries (Decay) Risk? The number of patients who suffer with dementia is set to rise with an ageing population . As well as living longer, patients will be retaining their natural teeth longer and will be less reliant on dentures . Although life expectancy is increasing, the amount of years a person may expect to live without chronic illness may not necessarily increase to the same extent. This phenomena is likely to have an effect of the provision of health care including dental, stretching the finite and limited resources set aside for dental care even further. Older patients will often suffer with worse oral health due to a complex mixture of additional risk factors . It is envisaged that the effect of these risk factors will be exaggerated in patients with dementia who are no longer able to care for themselves as well as they may have in the past. So will such a deterioration in general health also translate specifically into a higher risk of dental caries? Although risk from other oral diseases may also increase, it is dental caries where prevention is likely to be absolutely crucial to maintain good oral health. The common operative options of dental restoration for patients with advanced dementia may be impossible due to a subsequent decline in ability to cooperate with dental treatment with declining cognitive function. 2. Does Dementia Increase Caries Risk? Impaired cognition, apathy and apraxia lead to a decline in the continued importance of good oral health behaviours . A change in dietary habit including an increase in sugar containing foods and drinks ? Poor cooperation leading to difficulties with maintaining oral hygiene . Difficulty with accessing dental care due to poor cooperation in certain cases. The evidence from the literature presents a mixed picture when asking, “Does dementia increase caries risk?” For instance Philip et al 2012  found that the number of decayed, missing and filled teeth (DMFT) for patients living in residential care with and without dementia were not significantly different, though the level of untreated caries between the groups was significant. Their conclusion was that the level of caries incidence was proportionate to the level of disability rather than diagnosis of dementia alone and were keen to stress the importance of prevention. This trend for level of compromise being the main indicator of disease risk is also shown in a number of other studies. Srisilpanan and Jai-ua  found a strong correlation with severity of dementia and caries experience. 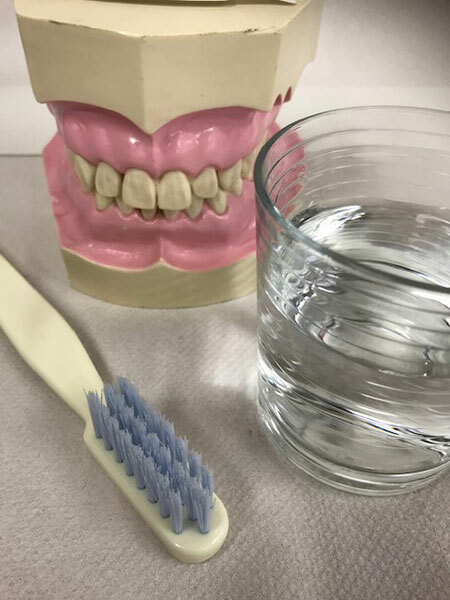 In their cross sectional study of dementia patients attending a memory assessment clinic, they found that patients had better than average oral health when first accessing the clinic and when functionally independent. However, the severity of the dementia of these patients appeared to have a significant effect on caries experience which is suggestive of an increase in caries risk with cognitive decline. Research teams led by Birita Ellefsen in Copenhagen also carried out research on patient groups attending memory assessment clinics. They found that patients with a low MMSE (Mini Mental State Examination ) score also had a higher incidence of caries . When the patients were followed up, they were found to have an elevated risk of both dental caries in the crowns of teeth (coronal caries) and caries in the roots (root caries) one year after initial referral to the clinic . The team also found that those with a diagnosis of non Alzheimers dementia had an even higher caries risk. Adam and Preston  examined the oral health of individuals with dementia in nursing homes in 2006, and could find no significant difference between the DMFT scores of those individuals with mild dementia and those with moderate or severe disease. One observation in the literature is that much of the research lends itself to examination and recording of the oral health status of those with early and moderate dementia as those with severe dementia are more likely to be non-complaint and therefore their oral status is unable to be accurately recorded for research data . This obviously has the potential to lead to bias in the results and may lead to under recording of the state of caries incidence experienced by a patient during their health journey with dementia. 3. A Different Pattern of Disease? A literature review carried out by Chalmers and Pearson in 2005  reported a different pattern of dental caries when compared to healthy older adults. Their findings demonstrated more coronal caries and retained carious roots as well as a higher prevalence of root caries. Ellefsen’s team in Copenhagen concurred with this finding  stating that root caries was highly prevalent among patients with recently diagnosed dementia, suggesting a need for active assessment. Their research showed that 89% had at least one root caries or coronal lesions and 66% of the group had at least two. Root caries lesions can often be treated preventively rather than operatively with application of topical fluoride and improved oral hygiene. This makes early diagnosis paramount to the success of such treatment. Chalmers et al in 2003  looked at community dwelling patients, with or without dementia. As a baseline the patients with dementia had a significantly increased caries incidence when compared to those without the disease. As measured at the start, 22% of the dementia group had at least one carious surface coronally and 31% had at least one root caries lesion. These figures rose to 41% for coronal and 50% for root caries when reviewed at one year. Not only were these results significantly different from the non-dementia group but also hinted at a high rate of deterioration in the dementia group. There are few longitudinal studies in the literature, but Ship and Puckett  in 1994 followed a small group of 21 patients with dementia and 21 without for a period of 2-3 years. The patients were all living in the community and were having no active medical treatment. Those with dementia were found to have decreased salivary flow rates and poorer oral hygiene. Additionally when compared to the non-dementia group, those with dementia had a (unsurprisingly) higher incidence of caries at the start of the study. However what was perhaps surprising was that there was no difference in the rate of deterioration between the groups at 2-3 years. Wu et Al’s systematic review in 2016  examined 16 longitudinal studies, five of which addressed the question of do patients with dementia have a higher caries rate. They summarised that the number of cavities was higher in patients with dementia but wasn’t significantly different due to small sample size. Foley et al produced a systematic review in 2017  which concluded that of the 28 studies they examined, patients with dementia had more carious teeth and worse oral hygiene (including more bleeding gums, poor denture hygiene). However what also was apparent was that this was an area of dental research with a limited evidence base due to the small amount of studies carried out. The oral health status of patients with dementia is often discussed by dentists who regularly care for this group of patients. With the advent of people not only living longer but retaining their teeth as well, clinicians who deal with patients with dementia are often presented with patients with severely broken down dentitions including extensive root caries, retained roots and secondary caries around existing restorations. The usual operative treatment options for managing caries such as fillings or crowns after removal of diseased tooth tissue, is in many cases just not a viable treatment option for a lot of patients who suffer with dementia. As well as possibly having limited cooperation they additionally often present with additional risk factors such as poor, uncontrolled diet; un-restorable remaining tooth tissue and difficulties with maintaining oral hygiene. Uncontrolled disease will lead to poor survival times for any repairs carried out. It is therefore evident that for these patients, preventive dental care is of the utmost importance. Delivering Better Oral Health (DBOH)  is a toolkit produced by Department of Health, Public Health England and The British Association for the Study of Community Dentistry. The latest edition is the third edition, published March 2017. This is the current gold standard for providing an evidence base for UK dental practice and deals with advice for general patients and those with an increased risk of dental disease, including those patients with dementia. Additionally the Seattle Care Pathway  offers more specific advice on managing prevention in older patients including those with dementia. This innovative pathway was developed after a three day conference in Seattle in 2013, and takes into account the different levels of frailty experienced by the patient as they age, and the increased dependency they have on care being provided by others. It considers patients to have five levels of dependency ranging from none, to high, and provides different advice on different actions needed to maintain oral health including assessment, prevention, treatment and communication. For prevention (Table 2) there is an emphasis, as with DBOH on increasing fluoride availability but also covers the use of antibacterial agents such as Chlorhexidine and care planning for oral hygiene. For those deemed high risk, oral hygiene strategies to reduce the risk of respiratory infections are also mentioned as there is now a growing consensus that poor periodontal health can be a contributory factor for aspiration pneumonia . Table 1 From delivering better oral health . Use fluoridated toothpaste with at least 1350ppm fluoride. Spit out after brushing and do not rinse, to maintain fluoride concentration. Increasing Fluoride availability for patients with increased caries risk (professional). Apply fluoride varnish to teeth twice yearly (2.2% NaF). Use a fluoride mouthrinse daily (0.05% NaF) at a different time to brushing. For those with obvious active coronal or root caries prescribe 2,800 or 5000 ppm fluoride toothpaste. Care home policies on oral health. Oral Health assessment and care planning. Care staff knowledge and skills. Availability of local oral health service. General dental practices and community dental services. And it’s hope their introduction will ensure that care providers for those who aren’t able to necessarily look after their oral health, will be better informed and trained to deliver daily oral care. Table 2 Prevention” from Seattle Care Pathway . Develop homecare plan to prevent or control oral infection, pain and dysfunction. Consider prescribing for caries – toothpastes, varnishes, gels and/or mouthrinses with a high (>or=5000ppm of F) fluoride content. Peridodontitis, antibacterial toothpaste, professional cleaning, chlorhexidine products (not long-term use in this group due to side effects), Oral Hygiene Instruction. Oral cancer: risk modification and education. Tooth surface loss: risk modification, sensitivity products as indicated, tooth/mouthguard. Develop daily oral care plan. Mucositis: advised denture-wearers to leave dentures out of the mouth in a dry environment when sleeping. Adjust methods of delivering pre-dependency prescriptions as needed (e.g. modified toothbrush handles or electric toothbrush). Assess risk of adverse effects of polypharmacy (e.g. dry mouth; sugars in medication) Offer relief from dry mouth as required with water spray in an atomiser bottle, chewing gum, salivary substitutes or pilocarpine. Monitor effectiveness of the daily care plan. Maintain contact with other members of the interprofessional healthcare team to monitor and help their contributions to the oral health regimens. Reassess the need to increase the concentration of fluoride in toothpastes and mouthrinses. Prescribe application of preventive and therapeutic products (e.g. fluoride varnishes, chlorhexidine rinses) by nurses and other staff. Reassess risk of adverse effects from polypharmacy (e.g. dry mouth; sugars in medication). Reassess need for relief from dry mouth and effectiveness of daily oral care plan. Focus on the increasing challenges of preventing and managing oral infections and disorders and of controlling pain and comorbidity, such as respiratory infections and dry mouth. Emphasise management of pain and infection. Maintain use of highly concentrated fluoride toothpastes, mouthrinses, varnishes and gels. Expand preventive strategies to manage severe mucositis and the growing risk of respiratory infections. Table 3 Advice for care home staff taken from NICE guidance . These recommendations are for managers of care staff who support daily personal care. daily use of any over-the-counter products preferred by residents if possible, such as particular mouth rinses or toothpastes; if the resident uses sugar-free gum, consider gum containing xylitol. Ensure care staff know which member of staff they can ask for advice about getting prescribed mouth care products, or helping someone to use them. Ensure care staff know how to recognise and respond to changes in a resident's mouth care needs. Ensure care staff know how to respond if a resident does not want daily mouth care or to have their dentures removed (see NICE's website page on your care). Although a lot of evidence based advice exists on how best to support good oral health in patients with dementia, there still appears to be a lack of this advice being followed in day to day health care practice . In the general health care setting it is important to raise awareness that many older patients now do in fact retain their teeth for longer and these teeth are potentially more vulnerable to dental decay as well as other oral diseases. Additionally these doctors, nurses and therapists need to know where to direct their patients for dental advice. Historically the majority of patients receiving care in their later years would have by that stage in their life lost all their teeth and probably worn dentures which arguably need less input and maintenance. It is also important for all health care providers to understand the benefit of a healthy diet and where possible this diet should have a low frequency of sugar to ensure oral health is also optimised. The author plans to develop a resource which can be used to provide information and guidance to health care providers and patients to help fill in any current gaps in their knowledge. Additionally dental health professionals need to hold greater importance for preventive dental care in this group of patients. The problem with state funded healthcare schemes is that good preventive practice is not always sufficiently funded leaving the dentist insufficient time to ensure that good prevention is embedded in a patient’s dental treatment plan. One unique solution may be to develop a bespoke service where patients with dementia can be referred to receive specific advice on good dental prevention by a service run by dental professionals (dentists, hygienists and dental nurses). This bespoke service would provide a useful resource for general health care workers to send patients whom they may not feel confident advising on dental issues; as well as a useful service to support general dental practice where time may not be available to provide the desperately needed prevention advice. Such a service would need to be carefully evaluated to prove its worth in terms of outcomes for patients and cost effectiveness. From both the current evidence available in the literature, and anecdotally from clinicians experienced in treating patients with dementia, it can be concluded that on balance, patients with dementia appear to be at a greater risk from dental caries. However, more research in this area would help produce a firmer evidence base to support this conclusion and should be encouraged. To improve clinical outcomes for patients with dementia, it is important for clinicians to ensure that patients have access to high quality preventive care which should include dietary advice and fluoride supplementation where appropriate to help mitigate this increased risk. The author did all the works. Dementia and Oral Health. Oral Surg Oral Med Oral Path Radiol Endod. 2000; 8: 2-5. Srisilapanan P, Jai-Ua C. Oral health status of dementia patients in Chiang Mai Neurological Hospital. J Med Assoc Thai. 2013; 96: 351-357. Zander A, Boniface D. Directly observed daily mouth care provided to care home residents in one area of Kent, UK. Community Dent Heal. 2017; 34: 32-36.